Home > Synchronous Belts > One Sided Timing Belts (Single Side Synchronous Belts) > SuperTorque STS Timing Belts > S3M Supertorque Timing Belts. 3mm Pitch > 100-S3M-549 SuperTorque® Timing Belt (Metric). 549mm Length, 10mm Wide. 183 Teeth. 100-S3M-549 SuperTorque® Timing Belt (Metric). 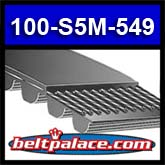 100-S3M-549 SuperTorque® Timing Belt (Metric). 549mm (21.6")Length, 10mm Wide. 183 Teeth (Teeth are flat topped).